Aug. 4-5, 2012, Richmond, B.C. Saturday night barbecue at the Cox household. I had some of the finest food I have ever eaten.Also an abundance of mirth and glee.Big thanks go out to the Cox family, not only for the BBQ but also for the help I received running the contest. Joan and Chris' granddaughters visited us at the field.What a delightful family. 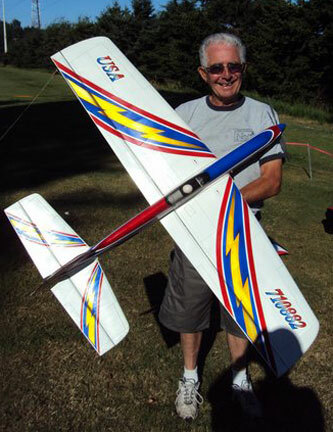 Dr Bob Baldock, who is the long time personal physician of the Cox family, multi aircraft owner, and all around nice guy, was arm twisted into his first ever competition flight. Looks like we now have one new competitor. 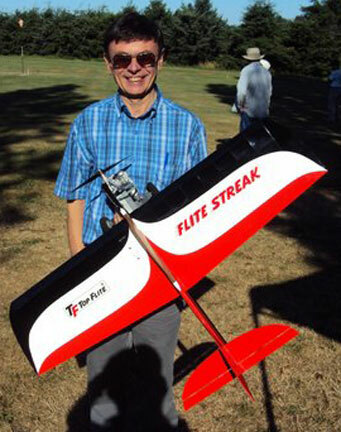 Bryan Carr from Calgary brought his brand-new, unflown, electric Pathfinder, hoping to find out how to operate the electric contraption. After a little coaching, we got it spinning. Had a couple of short test hops, and he used it to fly his official flights in Intermediate. Presto -- one new convert to electric stunt. A first time visit from Mr and Mrs Lanny Shorts, all the way from Trukee, Calif. We all hit it off well. Great to make their acquaintance. Very hot weather, no clouds, brisk wind that blew directly at the sun, and a smaller number of competitors than usual. Sure hope this is not a trend. 2. Lanny Shorts, Truckee, Calif.
Left, Chris Cox with his electric Crossfire. 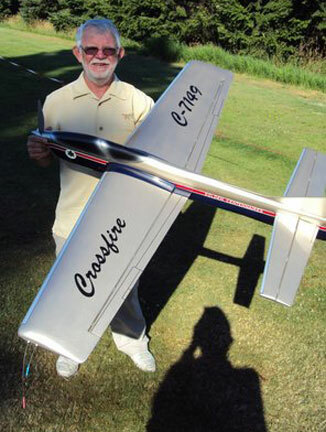 Cox moved into the lead in the Northwest competition standings for Precision Aerobatics and Overall Stunt with his score in this contest. At right, Alan Resinge with his Gypsy for Classic Stunt. All photos by Gerry Boyd. 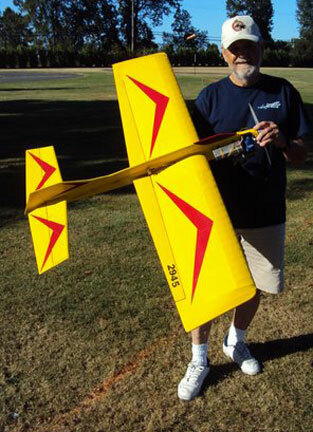 Left, Bob Baldock flew in his first contest. 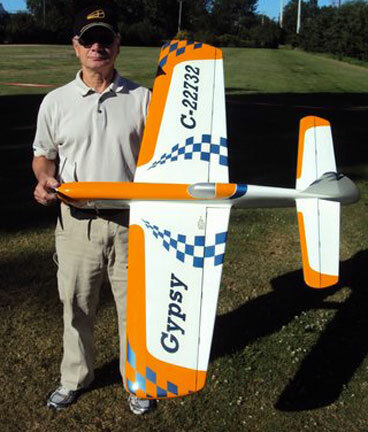 Right, Mike Haverly with his electric PA plane. 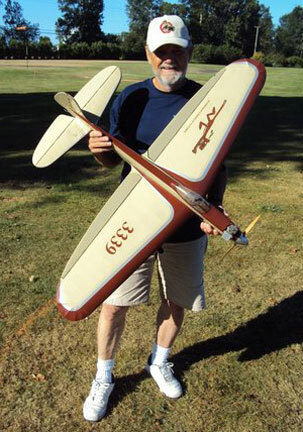 Lanny Shorts came all the way from Truckee, Calif. At left is his Classic plane and at right his Profile.